Black and white image of a Leibniz calculator. It has cover opened to show gears and rotating knobs. The calculator is sitting on a table. 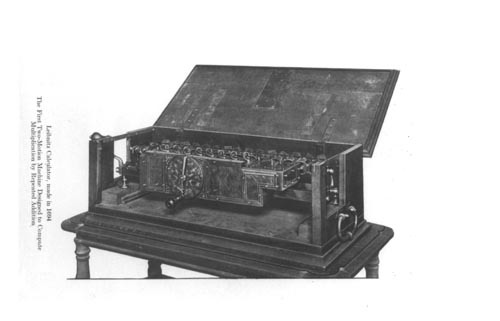 Recto left side metadata: " Lebnitz Calculator, made in 1604 The First Two-Motion Machine Designed to Compute Multiplication by Repeated Addition"